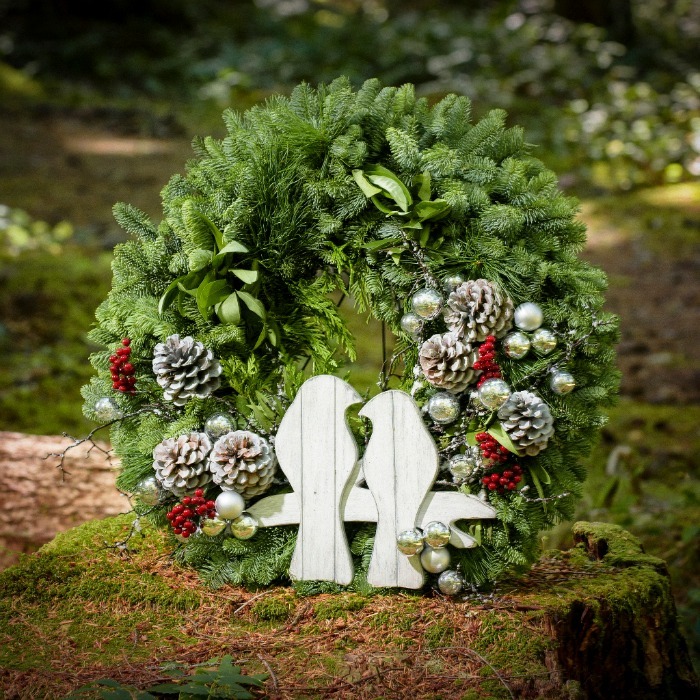 Do I have a fun giveaway for you today, one lucky reader will be receiving a beautiful wreath from Lynch Creek Farm, just in time for the holidays! There is something about fresh greens scattered throughout the home for the holidays that I love so much. From the amazing fragrance, the simple beauty and the love put into each piece, you just can’t go wrong! The best part about Lynch Creek Farms is the story behind the company. They started out with an organic farm back in 1984, where they sold their goods at the Olympia Farmers Market. What started out as a hobby and to keep the kids out of trouble has turned into a successful business for them. They use only local farmers and they do not cut down trees! I fell in love with this Two Turtle Dove wreath the minute I saw it! I placed it on our fireplace this year for Christmas and it instantly brought the whole space to life! You can find our Christmas home tour here. Last year I placed their fresh garland throughout the house and in our front doorway, the smell was amazing! 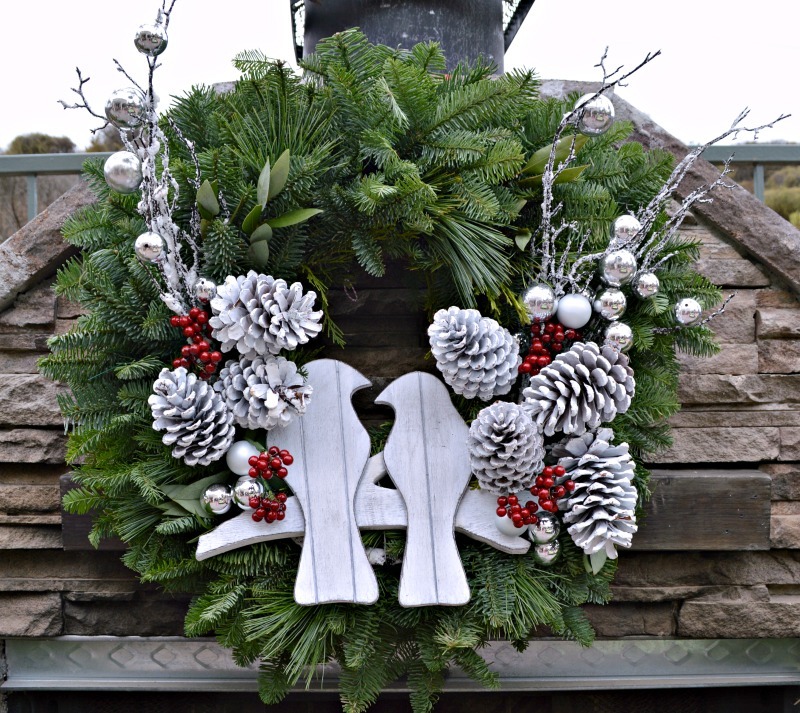 Today Lynch Creek Farm is offering One lucky reader their very own Two Turtle Dove wreath! Simply leave a comment below and let me know what your favorite thing is about the holidays! Have an amazing week and thanks for stopping in today! To me the holidays hold the hope for everyone of all things beautiful and joy filled. What a beautiful wreath! I have admired their pieces for the past several years. My favorite thing about the holidays is how magical it is. All the twinkling lights and Christmas cheer. I think for the most part it brings out the best in people. A chance to slow down, be with family and let your heart be filled with the magical special moments that unfold. First and foremost, our family celebrates the birth of Jesus at Christmas. We also enjoy the family time with everyone have time off from usual schedules. Thanks for the wreath giveaway. It’s so beautiful! Merry Christmas! Such gorgeous wreaths. Love yours on the outdoor fireplace. My favorite thing about Christmas is going to Church with all my family on Christmas Eve night and then coming home to dinner and exchanging gifts. Perfect way to spend the holiday. 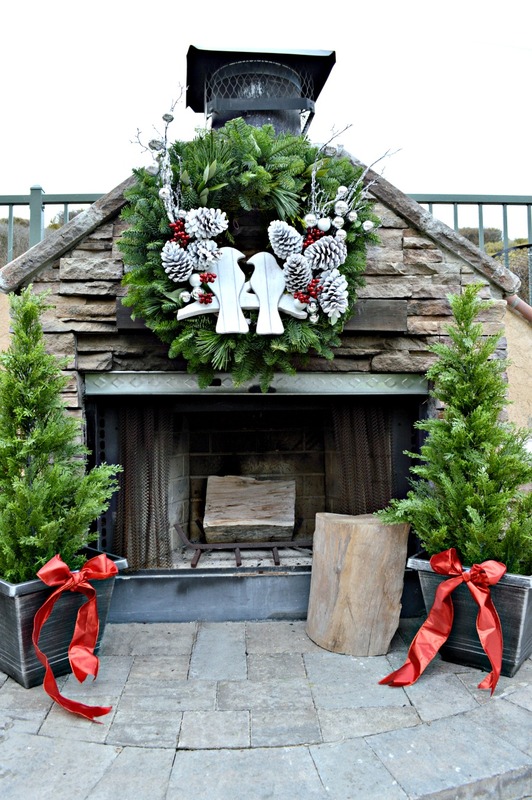 Beautiful..lynch creek has some gorgeous wreaths and table top decor. Is love the dove..it is a great Christmas symbol which my church uses on our Sunday programs. Oh Gish so many favorites..starting with my Christian faith and our out reach..my deep,southern roots and our much loved traditions..mostly getting in the kitchen with the girls..cooking up our feast..three day affair..not including desserts..naps, walks, memories shared .,new ones made..
What a beautiful addition to your outdoor fireplace. Lynch Creek Farms products are incredible. For me I love to get together with all my family for the holidays. I love all the choas and love that is there with all of us!! That wreath I’d adorable. I just love the festive feeling, seeing all the stores and public spaces lit up and twinkly. There’s an undeniable excitement in the air around the holidays! I love spending relaxing time with my children (mostly AFTER all the rush before Christmas!). Gorgeous wreath! Beautiful simply beautiful. Would love to win and display for the season. What a gorgeous wreath and gorgeous set up! Thanks for the chance and Merry Christmas! Gorgeous wreath. Thanks for the chance to win. So beautiful! Love your blog! I like spending time with my extended family during the holidays. Jesus and fudge and fresh greenery of course! Oh, my goodness. So simple and perfect! I always gravitate toward white. Merry Christmas! Beautiful greenery!! I bet it smells great?! My favorite thing about the holidays is the good it brings out in people. We tend to be more kind to one another and more wiling to help strangers. Wish it was all year long! My favorite thing about the holidays is that our whole family is back home together. It’s hard when your kids move across the country. My favorite thing is shopping for my kids and seeing them open gifts. Wow! The Two Turtle Dove Wreath is amazing! I reminds me of the love I have for my husband. He came into my world late in my life, but has turned my world upside down with his undying love and support. I am so blessed! My favorite thing about the holidays is making memories and spending time with family. Love baking ,hearing the Christmas music, and all the smells of the holiday . Would love to win this beautiful wreath. 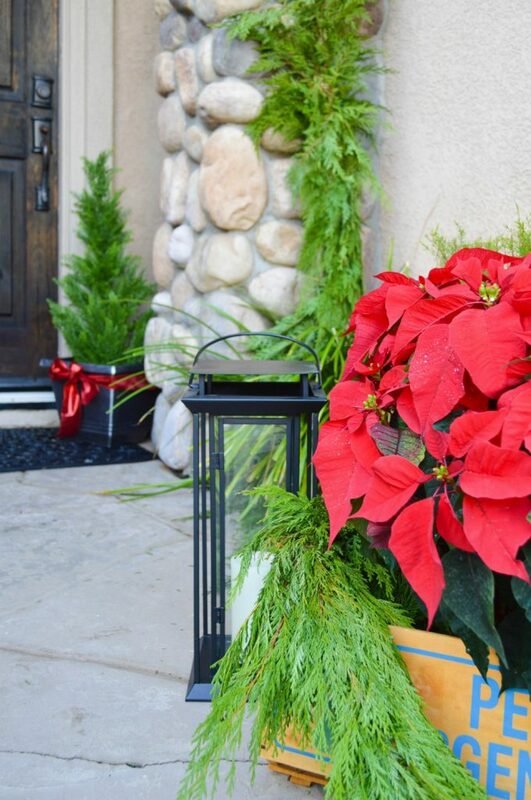 I love the festive vibe – everyone puts in extra effort to give their homes a holiday feel! Our favorite thing as a family is to take a few detours on the way home to check out Christmas lights! Love the tine with family! Family!! Thanks for the chance to win! Beautiful! I love it! Thanks! My favorite thing about the holidays is all the extra time with family. This wreath is so different then the norm and I love it! My favorite thing about the holidays is the feeling of love you see everywhere. People seem to be more in love with life and others this time of year. Gorgeous wreath!!! I love the different designs of wreaths! My favorite thing about the holidays is taking my kids to our local Christmas tree farm and letting them pick out our Christmas tree. We get to eat candy canes and ride in a tractor wagon to the tree fields and then the kids get to run around til the find the tree they think is perfect. After my husband cuts it down the tractor will pick us back up and take us to shake and bag our tree. This will be the third year we have done this and I love it. We are supporting a local family who runs this Christmas Tree Farm and we are giving our kids these great memories that they’ll carry with them for the rest of their lives. It’s priceless to me. My favorite thing is being arounf family and friends making new memories. I love listening to Christmas music! It always puts a smile on my face and brightens my mood!